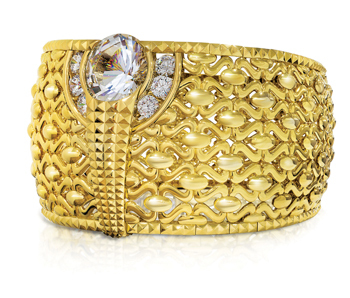 The world’s heaviest gold ring – the Najmat Taiba or Star of Taiba – created a big buzz at the 39th MidEast Watch & Jewellery Show held last month. Made by Taiba Gold & Jewellery of Saudi Arabia, the 58.686 kg ornament is studded with 5.17 kg of Swarovski stones. It has a certificate from the Guinness Book of World Records and is endorsed by the World Gold Council. “Najmat Taiba has a perimeter of 2,200 mm, 700 mm outer perimeter, 490 mm inside diameter, 500 mm width at the back of the ring, 250 mm width at the ring’s bottom. Fifty-five workers worked 45 days continuously for 10 hours a day to make this piece,” an Expo Centre Sharjah statement said. “It is diamonds that usually capture the attention, but Najmat Taiba has become the centre of attraction for jewelers and jewellery lovers alike,” said Al Midfa. Visitors were offered the chance to take a selfie with the ring or buy a replica to make the experience memorable. Held under the patronage of HH Dr Sheikh Sultan Bin Mohammed Al Qassimi, Supreme Council Member and Ruler of Sharjah, the MidEast Watch & Jewellery Show featured 500 exhibitors and brands across 30,000 sq m of exhibition space in all the six halls at Expo Centre Sharjah. Last year there were 450 exhibitors across 20,000 sq m.
The latest edition featured exclusive national pavilions and regional and international launches of new creations apart from a daily raffle draw that gave away prizes to shoppers. The Hong Kong pavilion presented prizes to visitors. Dhawal Jain, gemologist, Unialmaz, said the daily footfalls and enquiries were encouraging. The company showcased its exclusive wedding collection. Ammar Abdulhadi, executive assistant manager, Ahmad Kurdi Jewelers, reported the response was “fantastic” and expected a 20 per cent increase in sales compared to the last show held in April. Rohit Dhamani, director, Dhamani Jewels, said the response exceeded the firm’s expectations. Top jewellery designers took part in the first Middle East Jewellery Designers’ Forum held during the event. The forum was organised by The New Jeweller Group, an international media house for the gems and jewellery industry, in association with Expo Centre Sharjah with the aim of bringing together jewellery designers on a single platform to showcase their creativity.